Slow travel has become quite the catch phrase in travel circles of late, and although it’s something that I think quite a lot of people have recognised and practiced for many years, a bit of research suggests that labelling “slow travel” as such is something that’s only been happening in the last decade. Which means, of course, that exactly what “slow travel” means is still totally open to question, and that’s something I ponder a little in this week’s episode of The Thoughtful Travel Podcast. I’d love to hear your examples of slow travel, or a definition if you have one, so do hop down to the comments below and let me know what you think! Slow travel is a real buzz word these days but many travellers have been using slow travel principles for decades – because travelling slowly is a fantastic way to see the world and really get to know it well. 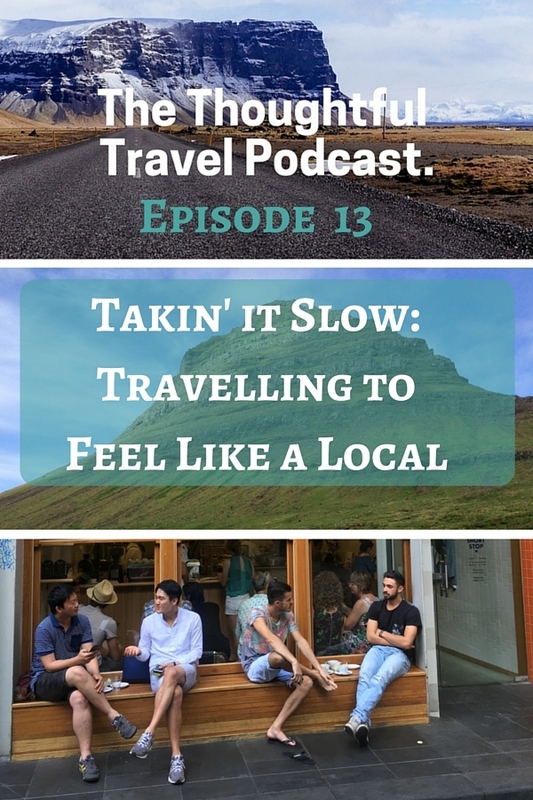 In Episode 13 of The Thoughtful Travel Podcast, I talk to three different travellers who have all embraced slow travel in their own way. First up is Tim Leffel, who prefers smaller towns and villages over big cities because it’s easier to travel slowly in a place where you can get to know the locals. I also speak to Candace Rardon, who as a freelance artist and writer is able to really practice slow travel pretty much the way I’d love to do it, and she does it both on a daily basis by sitting still somewhere for a few hours to sketch, and by planning her trips so she stays places for weeks or months. The final guest today is David Soto Jr who is currently in the middle of his own slow trip in a van around the United States. When I spoke to him he was sitting in his van on an airforce base with his dog Rusty looking on; since then he’s been exploring some of America’s most beautiful spots at a very leisurely pace.